There were 671 press releases posted in the last 24 hours and 153,369 in the last 365 days. ANNAPOLIS, MD, USA, March 5, 2019 /EINPresswire.com/ -- Artificial General Intelligence (AGI), the ability of computers to think like humans, may seem like a sci-fantasy set far in the future, but in reality, it is right around the corner. Without a degree in Computer Engineering how can one understand what this technology is, how it works, and what it means for our society as a whole? 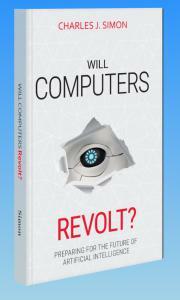 Now: Will Computers Revolt? Preparing for the Future of Artificial Intelligence, a new book by computer scientist and nationally-renowned software developer and pioneer, Charles J. Simon, who details the future of AGI in an easy-to-read format of what and how humanity should prepare for the impending revolution to come. For those imagining the future directions of intelligent technology, Will Computers Revolt? gives readers an excellent place to start. This well-researched and provocative book offers many real-world examples to interest the computer novice, along with enough technical detail to convince even the most well-versed computer scientist. Written in layman's language, Simon invites readers of all backgrounds to explore the world of computer intelligent technology and how we can best prepare to avoid potential future disaster. Charles J. Simon, BSEE, MSCS, is a nationally-recognized computer software/hardware expert with broad management and technical expertise. Mr. Simon’s experience includes pioneering work in AI, neuroscience, and CAD. His technical experience includes the creation of two unique Artificial Intelligence systems along with software for EEGs and other neurological test equipment. Mr. Simon is also an active, engaging and entertaining speaker on a variety of topics.